Nice classic set of shakers made by Avon in 1980. Made of nice ceramic and has spice names and pictures of spices and herbs on the shakers. 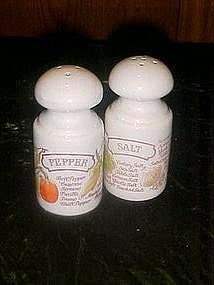 One says Salt and the other Pepper. Measures slightly over 4" tall and are both in perfect condition.